VertaseFLI undertook the demolition of the factory units and large office block, as well as the decommissioning and removal of the fuel storage tanks. Removal of notifiable asbestos was undertaken in accordance with HSE requirements and all works were completed on programme and without incident. Hydrocarbon hotspots were excavated and treated on site using bioremediation techniques. A deeper TCE hotspot was also excavated and treated during this phase of the project. Contaminated perched groundwater within the made ground and shallow natural ground was recovered from the hotspot excavations and treated via the VertaseFLI water treatment plant. Due to the presence of a bronze age burial mound within 100m of the site, an extensive archaeological survey was carried out on site during the works. VertaseFLI integrated the survey into the wider site works and managed the scope by extending hotspot excavations in order to expose the natural ground for archaeological analysis. 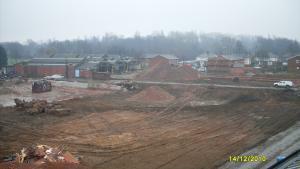 All excavated soils were retained on site and reinstated in accordance with the site specific materials management plan. 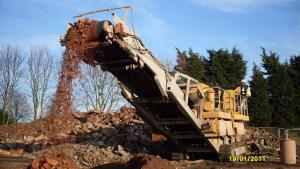 Demolition material processed to 6F2 secondary aggregate was also re-used.